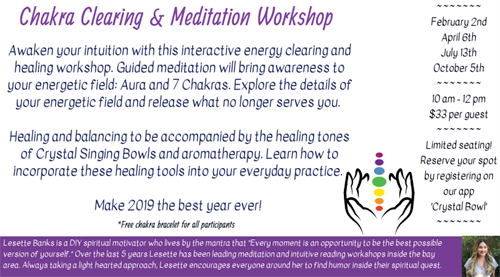 Awaken your intuition with this interactive energy clearing and healing workshop. Guided meditation will bring awareness to your energetic field: Aura and 7 Chakras. Explore the details of your energetic field and release what no longer serves you. Healing and balancing to be accompanied by the healing tones of Crystal Singing Bowls and aromatherapy. Learn how to incorporate these healing tools into your everyday practice. Each participant will receive a FREE chakra bracelet. Lesette is a Reiki II Practitioner and will end the workshop by giving a Reiki Chakra Healing to all participants interested.